"Lamb of God." Could it be any clearer? For some reason, Christians (and non-Christians) who can wax eloquent on the symbolism in other Gospel passages miss this one. In one sense, they're right. The Bible is not referring to lambs per se, but to all the innocents who suffer unjustly. Pigs, chickens, ducks, veal calves — and humans who are persecuted. Every day, in thousands of human-created Hells across the world, we crucify God's Creation. Is the suffering of chickens having their legs pulled off while fully conscious as bad as Jesus' suffering on the cross? I think it's worse, because they have no idea why they're in such pain, and they have not had one moment of peace or happiness in their lives. Christians who should know better (and who, perhaps, deep down, do know better) decry the suffering of Jesus, but assume the role of oppressor when the victim is an animal. 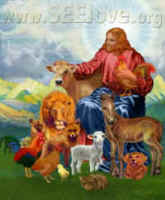 Jesus likened the comforting wing of a hen protecting her chicks to God's love for His flock. In factory farm hatcheries, male chicks are suffocated and dumped in the trash after they're born. The factory farm hen spends her days and nights in a severely crowded "battery cage" with slats for a floor so her egs will fall through. She lives a joyless life of forced deprivation. She becomes sick, featherless, and lifeless, and dies violently when her egg production drops. The other animals in factory farms, the ducks out of water in isolation cages, the bleeding rabbit with his head smashed against the wall, the caged fox that resorts to cannibalism, the pig going insane squeezing its snout through the metal bars, the trapped coyote biting off her own leg so she can feed her young...we keep on inventing new ways to make them suffer. “O God, enlarge within us the sense of fellowship with all living things, our brothers the animals [and all creatures] to whom thou gavest the earth as their home in common with us. We remember with shame that in the past we have exercised the high dominion of humans with ruthless cruelty; so that the voice of the earth, which should have gone up to Thee in song, has been a groan of travail. May we realize that all creatures live not for us alone but for themselves and for Thee, and that they love the sweetness of life.” -- the lamentation of St. Basil the Great. Lamb of God. The very essence of innocence. How do we treat him? With love and respect? As good stewards, entrusted by God to look after this member of His Creation? Or as a thing, a utility to be used however we want, without restraint? Have you seen a lamb up close? Not "leg of lamb," or "rack of lamb," but a real lamb, living and breathing. Have you buried your hand or your head in his soft fur? Have you watched him play, or sleep the most blissful sleep on a bed of straw? His beauty and purity are ancient. In prison-like industrial farms, the lamb of God dies for your sins every day, including the Sabbath, the day of rest. Unlike Jesus — this is crucial — he does not willingly sacrifice himself. He struggles when his throat is slit. As his strength is sapped and his blood drains out, he continues to struggle. As long as he breathes, he struggles. It is as though we nailed a child to the cross. Lamb of God. His intrinsic worth — by virtue of being created by God, given the breath of life, and endowed with a soul ("Nefesh Chaya" in the Hebrew Bible) — is completely ignored, trampled on, crushed. His innocence is violated and he suffers like Jesus to whom he is compared. In Isaiah's prophecy, the lion lies down with the lamb. But we can lie down with the lamb right now, which will bring us one step closer to God's Peaceable Kingdom.